Fujifilm Diosynth Biotechnologies Texas (FDBT) has two dedicated viral products facilities: The National Center for Therapeutic Manufacturing (NCTM) building was designed for process development and early phase clinical good manufacturing practice (GMP) production of advanced therapeutics including viral, microbial, and plasmid products. The newly built Flexible Biomanufacturing Facility (FBF) is designed for clinical and commercial GMP production of viral products. The NCTM boasts 14 first- and second-generation mobile cleanrooms. For upstream production cell culture, it has 10-L, 50-L, and 200-L single-use bioreactors and plans to add a 500-L unit. For fermentation, the company has 10-L and 50-L fermentors and 200-L dual-purpose single-use bioreactors. On the downstream side, the facility uses depth filtration for harvest and prepacked columns and GE Healthcare Ready2Process chromatography columns for purification. The facility currently offers liquid filling for early phase clinical supplies. Of all batches that it has produced, NCTM reports a 97% GMP manufacturing success rate. The FBF is designed for manufacturing late-phase, live viral vaccine and gene therapy products using mobile cleanroom technology. It has five mobile cleanrooms and could expand up to 10. The facility was designed for unidirectional flows of personnel and material and will go online for both clinical and commercial GMP manufacturing in 2018. The FDBT process development department develops virology and analytical methods as well as both upstream and downstream processes in 7,000 ft2 of laboratory space. Teams can perform scale-up runs in mobile cleanrooms using bioprocess equipment. The department’s goal is to establish a closed, continuous, single-use process based on a standardized approach, with a strong focus on the latest technology and innovation. FDBT has worked with a broad range of viruses and cell lines. The Texas team has the necessary knowledge and procedures to adapt adherent cells to suspension and vice versa, as well as adapting cells to serum-free media. It uses a number of viral qualification methods with multiple assays, virus quantitation methods, and analytical capabilities for measuring processing purity, residual detergents, host-cell DNA, and residual proteins. FDBT uses small-scale models for experiments and troubleshooting. Once optimized conditions have been developed in a small-scale model, demonstration runs at the 10-L scale precede scaling up to a 200-L single-use bioreactor at the Texas site. In North Carolina, Fujifilm Diosynth Biotechnologies has scaled up to 2,000-L bioreactors. Perfusion processes are gaining acceptance for their ability to increase cell density and product yield in reduced bioreactor sizes. The company has established a perfusion process in North Carolina using an alternating tangential-flow (ATF) device for GMP protein manufacturing. The Texas site will be setting up a similar perfusion process to support viral products. FDBT also uses a number of other modern methods for increasing cell densities. Its downstream technologies and systems are state-of-the-art. At the end of development, a laboratory-scale demonstration run is performed. Once a process has been perfected, all parameters directly scale to manufacturing scale. Processes are transferred to manufacturing by process sciences and process development teams. They provide “on-the-ground” support for engineering runs and technical support for full manufacturing campaigns. 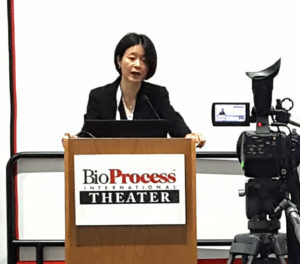 At its Texas site, Fujifilm Diosynth Biotechnologies has a flexible facility with mobile cleanroom designs and single-use technologies in both upstream and downstream processes. It offers GMP manufacturing capacity to produce clinical materials and commercial products, particularly viral products. The company has viral expertise along with process development teams as well as regulatory knowledge and commercial manufacturing experience. FDBT has a solid foundation and an integrated technical and regulatory network to ensure the success of GMP manufacturing for its clients.